Caption slip reads: "Photographer: Lapp. Date: 1951-09-07. Reporter: Cowles. Assignment: Marriage of Tip Topper Club members. 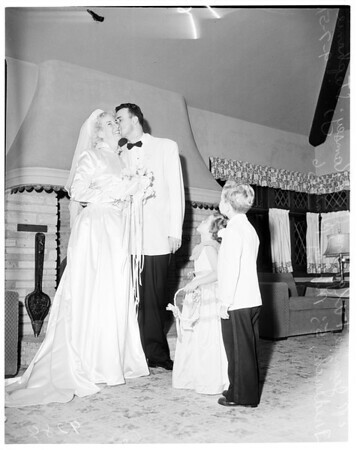 23/24: L - R: Jeanne fulghum, 29, six feet tall, and bridegroom, Jack Ramsey, 35, 6 1l/2 feet tall, cutting wedding cake after marriage at Church of the Good Shepherd, Arcadia. 7/8: Jeanne Fulghum, Jack Ramsey, Stephanie Frederick, 5, flower girl, and Mickey Ramsey, 6 1/2, nephew of b-groom".